A leading cause of death in the U.S., preventable medical errors claim hundreds of thousands of lives each year. Project Emerge, a joint effort between Johns Hopkins and Microsoft, is designed to save lives by creating a networked ICU. The third leading cause of death in the U.S., potentially preventable medical errors claim between 210,000 and 400,000 lives a year. 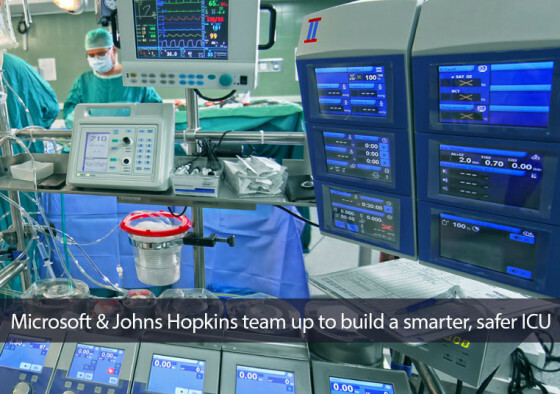 To help solve this problem, Microsoft and Johns Hopkins are working together to redesign the way medical devices in the intensive care unit communicate with each other. The goal is to develop technologies that will collect data from monitoring equipment in ICUs and then analyze it to prevent injuries and complications that can result from medical care. The genesis for this health IT solution is Project Emerge, a pilot program designed to use technology to restructure a hospital’s workflow in an effort to eliminate causes of preventable harm and promote better patient outcomes. Developed by the Johns Hopkins Armstrong Institute for Patient Safety, Project Emerge looks to eliminate all harms from the hospital environment, from medical complications like pneumonia to emotional harms such as a lack of respect and dignity. Working with Microsoft will allow Johns Hopkins to allay its significant clinical expertise with Microsoft’s advanced technologies, cloud services and software development. The final product will collect and integrate information from several modern devices and provide critical analytics, computing, database, mobility, networking, storage, and Web functions. This improved functionality will allow care providers to view trends in a patient’s care from a centralized location on any hospital-approved Windows device. Pilot projects are slated to begin in 2016. Dr. Pronovost, an internationally renowned expert in patient safety, has developed numerous tools to help improve patient outcomes in a variety of clinical environments. His development of a checklist protocol to eliminate central line catheter infections saved 1,500 lives and $100 million in the state of Michigan and is currently being implemented across the country. He was also instrumental in creating the Perioperative Handoff Toolkit a free, step-by-step approach to conducting a patient transfer from the time that the patient arrives at the PACU or ICU from the operating room. Click here to view more patient safety programs from Johns Hopkins.